The multi-purpose Kiano SlimNote 14.1” features a semi-matt HD 1366 x 786 screen, allowing you to enjoy truly deep colours. It prevents your eyes from getting weary even after several hours of work and guarantees perfect visibility both indoors and outdoors. 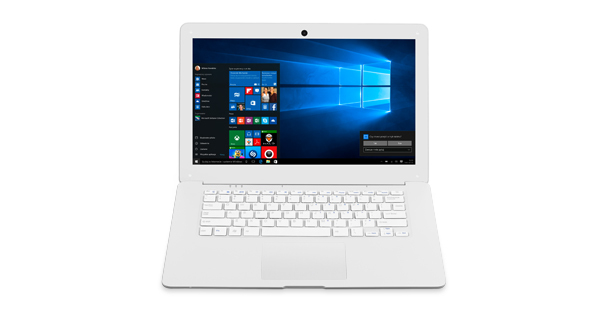 Along with a quad-core Intel Atom Z3735F processor, 2 GB DDR3 RAM memory and 32 GB internal Flash memory, along with Windows 10 Home system, the laptop safeguards efficient operation even if dealing with several tasks at once. The stylish appearance of SlimNote 14.1 will surprise you with its aesthetic body, made of high-quality plastic, and robust hinges that enhance the hardware’s resistance. A full-size chiclet keyboard with separated keys and a large touchpad that supports gestures is yet another advantage that contributes to user comfort. A battery with capacity of 10 000 mAh allows long hours of work without the need to recharge.